We sense your pride to serve our country. We know the work ethic and integrity of veterans is unparalleled due to the need to depend on each other for their lives. This quality is a good fit for the careers we offer at Jennie-O Turkey Store. We understand that veterans, through their proven experiences in the military, become valuable contributors from day one of employment. The transition from military to civilian life can be difficult. We’ve collected some articles aimed at easing that transition and leveraging your skills in a new setting. 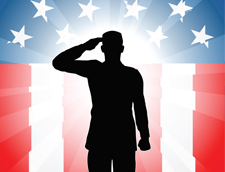 Military to Civilian Transition by Bradley-Morris, Inc.
Jennie-O Turkey Store is grateful for the service and sacrifice of our nation’s veterans. Through ongoing donations, partnerships, and programs designed to meet their specific and often unmet needs, we actively support the heroism of veterans and their families. Starting with Desert Storm, the company implemented a military bonus program for our employees who were called to duty. We once again implemented the program for the Iraqi Freedom and Afghanistan wars. The program provides a cash payment for each month the employee is called to duty. The program is designed to provide additional support for the company’s employees and their families during service to their country. "I would highly recommend Jennie-O Turkey Store as an employer who doesn't turn their back to veterans, but welcomes Soldier-Citizens for employment and works with them." Two of our soldiers returned from leave with a unique gift in honor of the support offered to them by the company and the community. They presented the company with an American flag that flew over the skies of Baghdad, Iraq during Operation Iraqi Freedom. "As a veteran, when I compare what options I had to advance in my career in the military to the opportunities I have to advance my career while working for Jennie-O Turkey Store, there is no comparison. As you grow in your area of responsibility, doors are always opening throughout all ranges of positions. The team member that has the best qualifications, regardless of seniority, will get the job." Jennie-O Turkey Store participates in local Veteran Career Fairs to actively recruit veterans and military spouses. Jennie-O Turkey Store along with Hormel Foods, was recognized with the Beyond the Yellow Ribbon award by the Minnesota Department of Military Affairs. This award recognizes the company for its long tradition of supporting American troops, both in peacetime and war.